This is a really easy recipe with few ingredients. I usually made this in the spring when we have fresh spinach and green onions from the garden and we like to grill it so the house doesn't get hot using the oven. But, it's just as good in the oven. 1 pork tenderloin - 1.5-2.5 lbs. Butterfly the pork tenderloin and season the outside with salt and pepper and rosemary. Then, put 1 to 2 strips of uncooked bacon on one side. 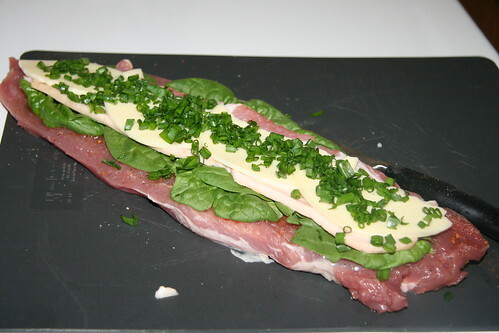 Top that with several leaves of fresh spinach, followed by either cheese, then sprinkle the sliced onion over the cheese and top with another strip, or two of uncooked bacon slices. This one has the spinach layer first but it's better if you start with a bacon layer. 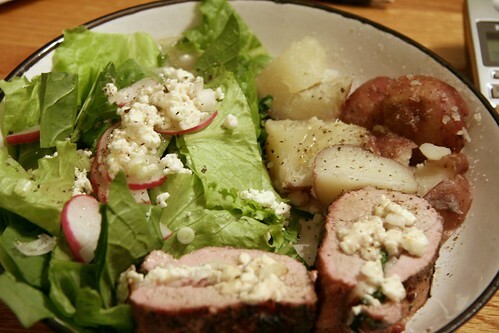 Next you need to close the tenderloin like a sandwich or taco by pulling the sides together. 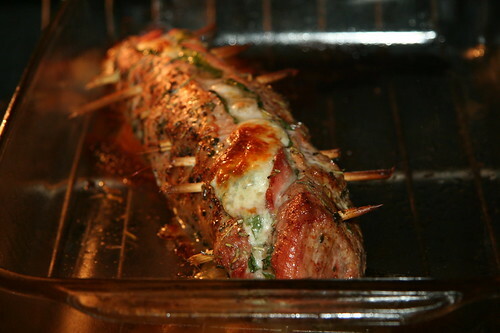 Then you need to run a skewer through it so it stays intact while it's cooking. Either weave a long skewer through the whole thing or take a wooden skewer and break it into several pieces and run each one through. I have found that it's easier to use the wooden pieces. Now either put it on the grill or stick it in the over. If grilling, cook for about 30 minutes - this will vary depending on the heat of your grill so stick a meat thermometer in it and make sure it's 150 degrees. If baking, cook at 350 degrees for 30-40 minutes. Once cooked, let it rest 5-10 minutes, then slice into medallions and serve! How do 2 people eat all that? i'm fasting currently and plan to break my fast on "that day" with this. it looks SO yummy! thank you. my mouth is watering. DEFINITELY trying this - looks amazing!